Organizations and institutions of all sizes use streaming video as part of their overall communications strategies .Numerous studies have shown that video is the most effective means of communicating for impact and retention . this has been proven in the real world by thousands of customers who are using video to enhance their enterprise communications. However, it is important to note that video is very different from other data types . there are many challenges to ensuring that video is always accessible without disrupting the network and other mission critical applications. 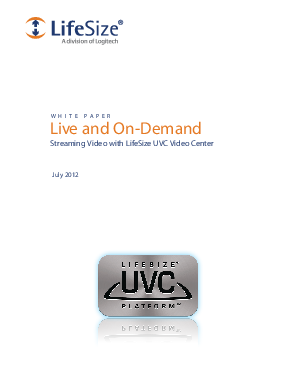 This paper will discuss streaming video characteristics, applications and challenges, and how LifeSize can help any size organization implement an enterprise video streaming system that's easy to deploy and use without strain on the network.